As we go along our lives, always with a desire to learn something new, we eventually discover something. You just have to listen to your heart and push on. Just like what this nurse did to get international fame. 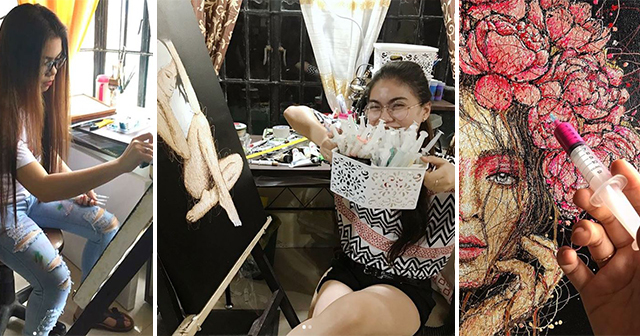 A Filipino nurse, named Kimberly Joy Magbanua, broke the norm in the world of painting. Instead of using paint brushes and a color palette, Kimberly makes use of syringes. She combined her profession and her love for art in the unique way that she had gained renewed fame internationally. The idea of using syringe as her instrument in painting her masterpieces, came to her back in 2015 when she was in one of her shifts and was giving medicine to one of her patients. According to her, "I just want to collide my profession and my passion." This self-taught artist is from Negros and works as a staff nurse in a government hospital. We are aware that the job of a nurse, although heroic, is also very stressful during their longtime shifts. It's a wonder how she juggles her time painting and her work as a nurse. According to her, "Though there are times that my shifts are so stressful and toxic, I still have time to do my art because it is my comfort zone. Art feeds my soul." She often paints animals and human portraits. But when she was asked how she uses the syringe she said, "I remove the needle shaft leaving only a piece of it. I use different needle gauges depending on the details of the painting. Since I'm working with paint, it dries up quickly, and I have to change the needle if it clogs up." It is so amazing to have an artist who pursues both her profession and passion. She will surely make a name in the world of art, and we hope she continues her unique talent.